Flojet’s ultra-efficient, “stand-up-to-anything” G57 pump has become an industry leader. And now Flojet has raised the bar on pump performance even higher with the G57 Two- Pump and Four-Pump system. The Two-Pump system delivers flows of up to 10 GPM, while the Four-Pump system delivers a 20 GPM flow. 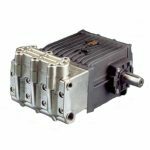 The G57 Two and Four-Pump systems are ideal for a host of heavy-duty industrial applications. These air-operated pumps are fitted with Santoprene® or Viton® elastomers to handle even the harshest cleaners and solvents. A patented ceramic shuttle valve ensures a lifetime of stall-free operation.